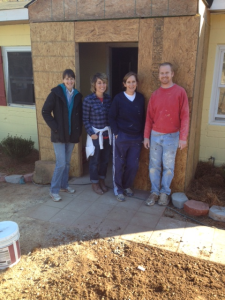 Pictured L – R, Ann Lively, Jessica Dix, Cindi McCarthy and Chris Ragan of Strawn & Co., Insurance participated in a renovation project with the Henry County Fuller Center for Housing on Friday February 13. The Fuller Center for Housing is an international, Christian non-profit organization that builds and renovates houses in partnership with families in need. Homeowners work hand-in-hand with volunteers to build or renovate their homes, which they then pay for with no interest charged or profit made. To learn more go to hcfullercenter.org.